Cedar Lane Elementary School (Middletown, DE). 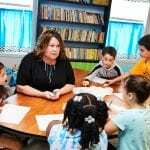 Cedar Lane implements lesson studies that include grade-level teachers collaborating to create a single lesson to be used team-wide. After the creation of a lesson, a full grade-level of teachers participate in a fish bowl lesson study. This includes one teacher using the lesson with her students while colleagues observe. After the first round of instruction, the team meets to debrief and discuss enhancements/changes needed to strengthen instructional planning and delivery. After editing the lesson, a different teacher uses the newly revised lesson with their class while colleagues again observe. The framework around this experience is based on the student’s needs and what specifications the team has set forth. Teachers are always eager to participate in fish bowl studies as it gives them the opportunities for immediate feedback and implementation of new strategies in real time.